Why Do I Need Balustrades? Balustrade laws differ depending on the height of the balcony or deck above the ground. 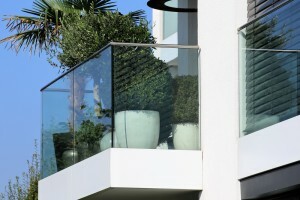 Under the Building Codes laws, where the difference in height from a balcony or deck to the ground or another lower level is a metre or more, a balustrade of at least a metre high is required. For decks more than a metre above the ground, openings in balustrades also cannot be greater than 125mm. For decks more than four metres above the ground, balustrades can’t have any climbable elements (such as horizontal rails) located between 150 and 760mm from the ground. Retaining walls don’t require a balustrade unless they’re associated with a path of travel from, to or between buildings. However, for other retaining walls, it’s always a good idea to have a balustrade or other barrier if there is a risk of someone falling from the retaining wall. Balustrades must also be constructed so they can resist forces that might be placed upon them, including strong winds and people leaning against them. What Are The Common Types of Balustrades? Wrought iron balustrades are a stylish way of providing security to a deck or balcony, can be finished in a variety of colours, and can also be customised as well. Wrought iron is a strong and robust material, and unlike aluminium and timber that can rot and rust, wrought iron can stand up to all types of weather conditions. Wrought iron is also relatively maintenance free, unlike glass for example, that requires constant cleaning, however these types of balustrades must be sealed and coated regularly in order to deter rust. Glass balustrades offer a classic, modern look that creates unobstructed views, and they are relatively safe as they are made from toughened glass and children can’t climb on them. They also act as a wind barrier to create warmth in hilly or coastal areas, particularly during winter. Constructed from a series of glass panels that are semi-framed, fully framed or frameless, the glass can be clear, semi-transparent, etched, frosted or tinted to the colour of your choice. Glass panels can also be framed with aluminium or stainless steel and may be supported by wooden materials as well. Framed panels also come in a range of designs and powdercoat colours and offer a choice of handrails. Downsides to glass balustrades include that they require a bit of cleaning maintenance, particularly if you have young children who like leaving smudges on the glass! Birds and other animals (or people) can also bump into them if the glass is transparent. Glass balustrades can be used on balconies, pool fencing, stairs and standard fencing, and framed and semi-framed versions suit privacy screens as well. If you’re after a more traditional option that offers a classic look, you might want to consider wooden balustrades. These can be painted or stained to the colour of your choice, and can be carved, turned or left sleek, depending on the style of balustrading you are hoping to achieve. Factors like weather, humidity and pests can also rot wooden surfaces and wooden balustrades are also susceptible to water damage. Hence, they need to be stained or treated regularly particularly if they’re installed outdoors. Another popular option in terms of its modern appeal, stainless steel balustrades work well with a range of other building materials including wood and glass. They have a timeless appearance, can be used both outside and inside the home and can be manufactured with a variety of coatings that will keep water from damaging their surface. This is particularly important in coastal areas as sea air can cause steel to ‘tea stain’, which can look like rust. These types of balustrades offer a choice of handrails and can be combined with glass for a contemporary look. Some of the cons of steel balustrades are that they can weaken and buckle in extreme heat, and they can be a more expensive option compared to materials like aluminium. Stainless steel balustrades can be used on stairs, balconies and standard fencing as well as pool fencing. Offering a contemporary look, strand wire balustrades are easy to maintain (much like aluminium), however the regulations are quite strict in terms of the amount of wire that’s required for safety, so they can look very busy. Strand wire can be used on stairs and balconies and balustrades often come with a choice of handrails, however as they’re a premium product they’re often more expensive than glass or aluminium options. For a cost effective option, you can’t go past aluminium balustrades. These are extremely durable (they won’t rust), very low maintenance and can be used inside or outside your home. Suitable for all weather conditions, powder coating offers protection and creates a beautiful shine. The process of powder coating also means they’re available in a wide range of colours. At FenceCorp, we offer aluminium balustrades as well as framed glass balustrades that cover a wide range of styles. These work beautifully with most types of environments and homes from classic Queenslanders to more modern properties. Need to add the finishing touch to your new fencing with some balustrades? Contact the professionals at FenceCorp today on (07) 3715 5055. Posted in Advice, Balustrades. Bookmark this page.